Using home facial steamers is a great way to deeply clean your skin and open your pores. Many of us have felt the benefits of steam treatments at a trip to the spa or sauna. But how can you recreate this experience, and its benefits, at home and which is the best facial steamer to buy? We all struggle to find the best options for home skincare—maybe you’re looking for something different and natural to supplement your beauty routine. If you’re after clear, hydrated, and youthful skin, a steam machine might be just what you need. The warm moisture works to open pores, removing dirt, makeup and other impurities—including dead cells,—to give you soft, naturally glowing skin. Why use a Home Facial Steamer? 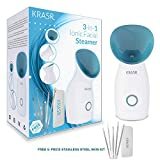 Krasr 3-IN-1 Nano Ionic Facial Steamer: This facial steamer comes with great features and accessories that give you a lot of control. It’s light and easy to use and will help to make skin smooth and clear. The addition of blemish removal tools is a useful bonus. Pure Daily Care Nanosteamer 3-in-1: With an ultrasonic vaporizer using ionic particles, this model creates a very fine mist. It has a great selection of special features and accessories. The multifunctionality of the 3-in-1 means this model can serve a variety of functions. Kingdom Cares Hot Mist Facial Steamer: Known for its durability and dependability, it also has a sleek design. Using ionic steam, and the variety of functions you can count on this model to help you keep your clear skin for a long time. KINGA﻿﻿ Daily﻿﻿ Care Nano Steamer: Taking only 30 seconds to heat up, this steamer is ready when you are. The simple design is convenient and easy to use. This model comes with accessories and is a good value. 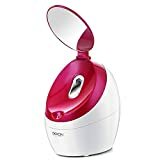 Secura Nano Ionic NanoCare Facial Steamer: This steamer is affordable and easy to use. The humidifier function can be useful and the automatic shut-off is a good safety feature. The sleek and simple design looks good and help you to hydrate and clean your skin . 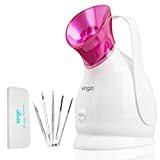 This state of the art facial steamer is a favorite among women and comes with a number of great features and accessories. With all the perks and shining reviews, it’s hard to go wrong with this steam machine. Customers like the steamer because it is light and easy to use and transport. It has helped some users to reduce their acne breakouts and has special features so you can easily control the levels of moisture. This model creates ionic droplets for deep penetration. It also comes with blackhead removal tools and a large water reservoir. According to online facial steamer reviews, this is an effective option for use at home. Users found it helped them to reduce dryness and blemishes, and it easy to use. This works to rejuvenate and hydrate your skin using ionic steam particles. 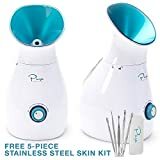 With the features you’d expect from a facial steamer, plus timer settings and a reputation for dependability, this model might be good for someone planning to use a steamer regularly and for a long time. People like this home facial steamer because it heats up quickly and works dependably. It has a sleek look and is easy to use, so it is highly rated in facial steamer reviews. With a good range of features and the fastest start time, this model is great for the woman on-the-go. This home facial steamer is inexpensive and simple to use, so it might be a good first choice for someone who is uncertain about purchasing a steam machine. Ready in only seconds, this home facial steamer is dependable and gets the job done. This makes it well rated in online facial steamer reviews and users think it’s a good value. The advantage of this steam machine is that it’s easy to use and gets the job done. This model is simple and straightforward. Steam machines and home facial steamers have been gaining popularity over recent years because they offer many of the benefits of spa facial treatments right in your own home. The tiny water particles in the steam help to open and clean pores, make your skin more absorbent, and increase circulation. Regular use of home facial steamers can help you to fight acne breakouts and retain a youthful appearance. There are many home steam machines on the market, so making the right choice can be difficult. Some options are professional quality and can make you feel like you’re at the spa, while others are easy to use and great for transport. People have been using steam from hot water to improve their skin for centuries. Facial steamers work by quickly and effectively heating water until it turns into steam made up of tiny hydrating water particles. By treating your face with this vapor, you open your pores, allowing for any makeup residue or dirt and dust particles to be released from your skin. Home facial steamers provide even and consistent amounts of steam so that you can give your whole face a smooth and even treatment without ever running out of hot water. This treatment reduces the likelihood and frequency of breakouts, leaving skin smooth and soft. Facial steaming also increases circulation and blood flow, which can help keep your skin soft and prevent aging. 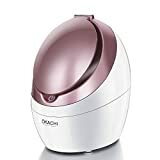 Because portable steamers use only water to treat your skin, this is a great option for those looking for natural skincare options or anyone who wants to avoid harsh chemicals due to dry or sensitive skin. Using a home steamer can also help make the use of various creams and face masks more effective, because your skin becomes more hydrated and open, allowing your skin to absorb products more effectively and efficiently. Be careful though, if you have very sensitive skin the heat from the steamer may be hard for your skin to handle. Always take things slowly, using the machine for only a few minutes at first—if you have delicate skin—and then gradually increase the duration of your treatments. Professional facial steamers are often used by both spas and dermatologists. While these treatments are relaxing and effective, they can also be time-consuming and expensive. Today, you are able to reap all the benefits of using a steamer machine without leaving your home. Some people use home facial steamers almost every day, especially when they are trying to control acne breakouts. But portable steamers can also be used to great effect less frequently, whether a couple of times a week or as a special occasion home-spa treatment. Using a steam machine before applying masks and creams makes your skin more open and capable of absorbing the helpful ingredients found in these products. Many of the available models also double as humidifiers and towel warmers. You might find these added features to be incredibly useful the next time you want to open up your sinuses because you are suffering from allergies or a cold. Home facial steamers range in water droplet size, ease of use, and range of features and accessories offered. It is important to carefully compare different models and read the best facial steamer reviews so you’ll be guaranteed to make the best choice for you. You now know a bit more about how steam machines work to improve your skin and what the benefits of purchasing a home facial steamer are. We have also covered some of the main features and pros and cons of different models. So, now it’s time to consider which option is going to be the best for you. We at Beauty Shortcutips are here to help you make the right decision so that you can make an informed choice and start reaping the benefits of home steam machines. First, ask around and see if any of your friends use facial steamers. If, so they might be able to recommend what they have found to be the best facial steamer. However, if you don’t have anyone to ask, don’t fret. There are thousands of facial steamer reviews online and these can be an invaluable resource for you when making your choice. Take your time to carefully read about what other people have to say, both good and bad, and you’ll be more likely to make the right choice. Perhaps you are want to be able to control the humidity or you’d prefer a set of blackhead extracting tools to come alongside your purchase of a portable steamer. Perhaps you want a color scheme that will look nice in your bathroom or a model suitable for travel. You know your own needs and wants better than anyone else, so be sure to consider all the benefits, special tools, and features of different models before making your purchase. Some models are very inexpensive, but may also be very simple and more prone to malfunction. Other models might be too much of an investment if you’re just looking to give home facial steamers a try. However, by using this guide and considering your options, you are sure to find a model that offers great features at a reasonable price. Shop around to ensure you get the most bang for your buck. After reviewing the top choices for home facial steamers, we have found that the best option is the Krasr 3-IN-1 Nano Ionic Facial Steamer. This model offers all of our favorite options and tools, such as the ability to control humidity, towel-warmer and humidifier features, and a stainless steel blackhead extracting toolkit. And on top of all that, users swear by it. 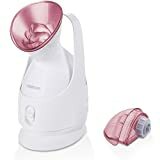 This model provides all the benefits of a professional facial steamer in the comfort of your own home and regular use of this steamer is sure to leave your skin hydrated, glowing, and healthy. With its reasonable price, plus a wide range of special features, this durable model is likely to be the best facial steamer for you. The KINGA facial steamer is a good buy, i have personally used it and will recommend it to anyone out there in search of great face steamers. It leaves your skin glowing and soft reduces and prevents acne and open sinuses. It can clear your face of all toxins and impurities. Very good buy.